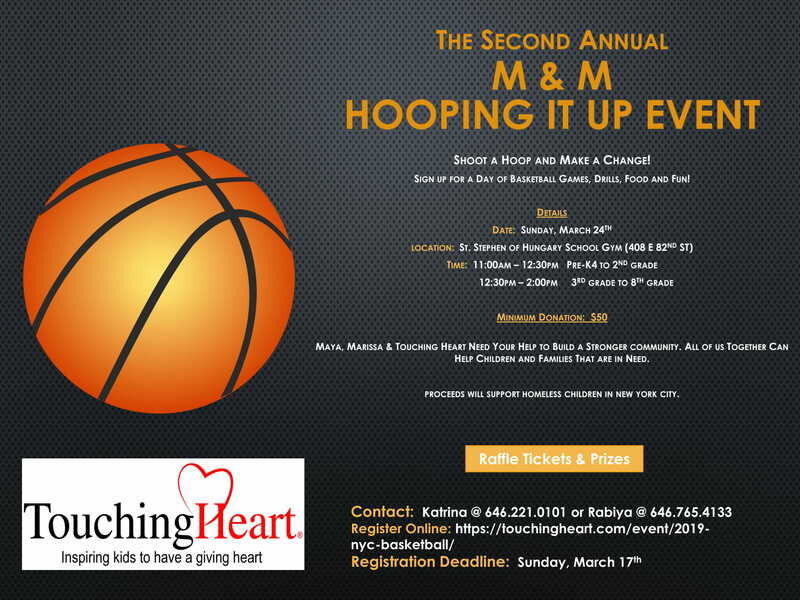 The Second Annual M & M Hooping it Up Event! Maya Magnus and Marissa Hennigan have teamed together with Touching Heart to share their love of basketball and philanthropy! Maya, Marissa & Touching Heart need your help to build a stronger community. All of us together can help children and families that are in need! Proceeds will support homeless children in New York City. Please join us at Saint Stephen of Hungary School Gym (408 E 82nd St, New York, NY 10028) for an afternoon of competitive drills, knockout games, and shoot outs while raising funds for those in need. For those who don’t play basketball, there will be snacks, raffles, and so much more! This is a fun event for kids of all ability levels and a great chance to connect with the community. Register below! Tickets are $50 per participant. (Registration deadline: Sunday, March 17th) Tickets are non-refundable. Submitting will forward you to our paypal page in a new browser window/tab. Please make your payment there. Ticket prices are $50.00 each. Please be sure that you are not blocking popup windows.